There is this myth of the quiet country life. The only quiet is the absence of traffic and other city noises. Summer music fills the air around the clock. Grasshoppers have short antennae and fat, round bodies. They make a clicking sound as they flee anyone’s approach. The usual daytime music makers are the cicadas. They haven’t been as loud as usual as though the weather changes have hurt their population. Not to worry, others fill the void. All grasshoppers and katydids have two pair of shorter legs and a rear pair of long jumping legs. Young ones only hop away. Adults use the hop to help them fly off using the thin under wings hidden beneath the thick outer wings. Grasshoppers scrape away. Long ago I thought a grasshopper was a grasshopper. Back then there were only Holstein, Guernsey and Jersey dairy cows too. City kids don’t know much about the country. There are lots of different grasshoppers. 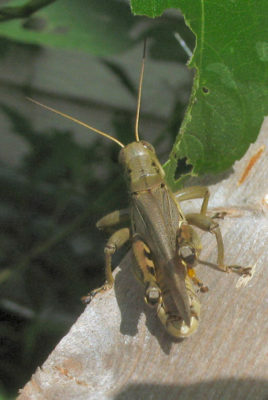 It’s hard to get pictures as grasshoppers are favorite meals for lots of creatures, especially birds. Usually I see large and small winged ones half flying, half gliding away. Some wings are clear. Others are yellow or black or both or with broad stripes. There are even some with only nubbins of wings. 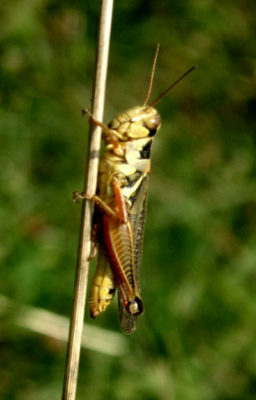 Male grasshoppers find a secluded bit of grass and scrape a wing against a leg. These have special hard bits on them to make noises as they rub together. Female grasshoppers come to the summer music concerts. Grasshoppers have short antennae. Katydids have long antennae. They give night concerts. Baby grasshoppers and katydids look like adults in miniature, but without wings. 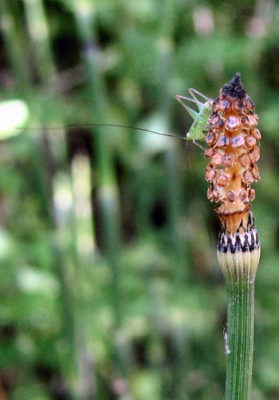 This baby katydid is on an Equisetum cone less than an inch tall. Most of the katydids around here are green. They are narrow at their heads, get broad, then taper down again. From the top, they are thin. Grasshoppers are round the entire length of their bodies. 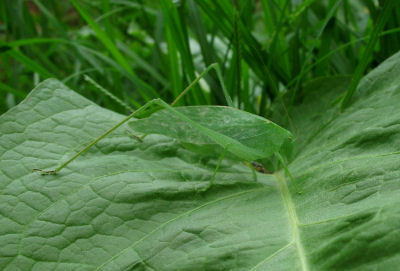 Katydids are similar to grasshoppers, but have very long antennae. Their wings are tents over their bodies and make them look very thin. I did find a pink katydid once. I’m sure there are more around. 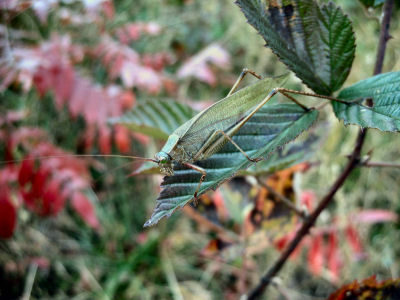 Katydids are more secretive than grasshoppers or seem so as they stay behind the leaves on bushes. Some katydids are totally pink. This one has pinkish red legs and highlights. Notice the hook on the end of the abdomen. 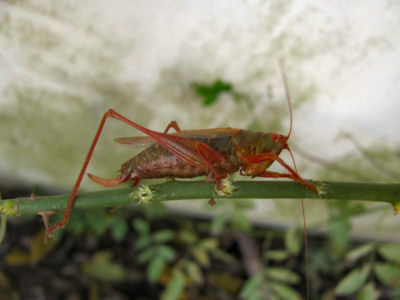 It is common on katydids, but not grasshoppers. As the sun goes down, the male katydids settle on bushes. They scrape their wings together. Scrape doesn’t really describe this. The wings move so fast, they seem to vibrate. These have thick edges to rub together. Female katydids come to their summer music concerts. Green katydids can be hard to spot. They are usually the same color as the leaves they sit on. City visitors find country summer music annoying. It keeps them awake all night. For me it’s a country lullaby I would miss visiting the city. This entry was posted in Ozark Hills and tagged differences between grasshoppers and katydids, natural country sounds on August 22, 2018 by [email protected].